I love to serve this when friends come over because I can prepare it in advance and just put the pie in the oven when needed. Heat half the oil and butter in a large, heavy-based pan, add half the meat and fry quickly, over high heat, until browned. Remove the meat with a slotted spoon and set aside. Repeat with the remaining oil, butter and meat. Add the onions to the pan and fry for 6 minutes, until softened and light brown. Add the garlic, reserved meat, herb bundle, tomatoes, wine and seasoning. Stir, then bring to the boil, cover and simmer gently for 1 1⁄2 hours, until the meat is tender (or bake in a covered casserole dish at 170°C, gas mark 3, for 1 1⁄2-2 hours). Remove from the heat, stir in the olives, remove the herb bundle and tip into a 1.5-litre pie dish. Leave to cool for at least 15 minutes (cool completely if freezing before baking). Preheat the oven to 200°C, gas mark 6. Measure your pie dish and roll out the pastry to fit, leaving an extra 3cm border all round. Brush the rim of the dish with beaten egg. To help fix your pastry to the pie dish and reduce shrinkage, cut a 2cm strip from all round the pastry and fit onto the rim of the pie dish. Brush the pastry strip with egg, then lift the pastry on top, pressing the edges to seal. trim off excess pastry. 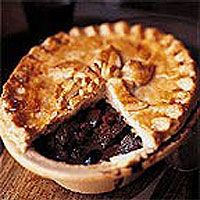 Pinch the edge all round to seal and make a small hole in the centre of the pie to allow the steam to escape. Brush the pastry with egg, and decorate the top with leaves cut from the leftover pastry, if desired. Brush the decoration with egg. Bake for 30-35 minutes, until deep golden brown. If you prefer to use ready-rolled shortcrust pastry and it's not quite big enough for your dish, just roll it out a little more to cover the pie.